A very bright mastering engineer in England, named Ian Shepherd, has been promoting the use of various tools to alleviate the extant loudness war in recordings. He rightly points out that monitoring program loudness is the current law, but that rather than worrying about loudness per se, we should actually be concerned about the dynamic range in the music. Without appropriate limits on recorded loudness levels, there won’t be any room for dynamics, but he has developed a way of mixing that focuses first on dynamic range, and then loudness control will follow. I love sound, and I love measurements. Physics is the science of measurement. So here we have a chance to objectively measure the effect of Bongiovi’s DPS process for re-inflating the dynamic range lost in overly compressed music tracks. 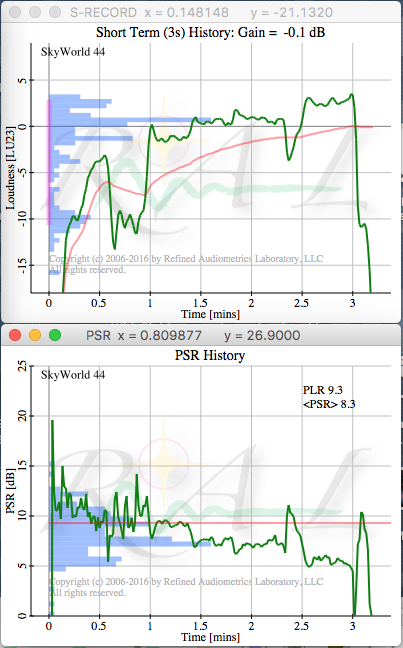 I modified my loudness scanning tool to include Ian Shepherd’s notion of PSR vs PLR. 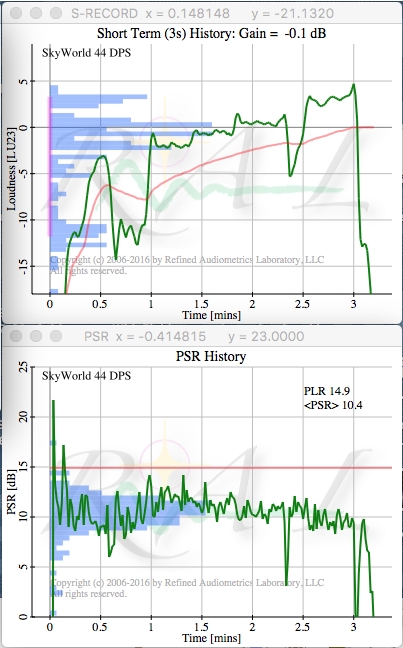 PSR stands for peak to short-term loudness, and PLR which stands for program loudness ratio. In R128 measurements, the underlying loudness of the music is measured as the RMS of a filtered signal which has been shown to correlate well with people’s perception of loudness. There are three distinct time periods over which this loudness is measured: momentary which is a 400 ms moving average, short term which is a 3 sec average, and integrated which is for the duration of the music. His PSR measures the true peak to short term loudness ratio, while his PLR measures the maximum true peak to integrated loudness of the music. In some sense this is a measure of the instantaneous dynamic range, or crest factor, in the music, compared to overall dynamic range. We know that various music services are now imposing loudness leveling on behalf of listeners. Apple uses SoundCheck, and YouTube and Spotify also perform loudness leveling on playback. Each of these services has a different notion of how loudness should be measured, and what range of loudness they will permit. Apple’s SoundCheck uses a loudness target of -15 LUFS. That means that nothing could ever be played with a peak to average ratio greater than 15 dB without first reducing its playback volume for the listener. What Ian Shepherd recommends is that mixing engineers should pay attention to the PLR to see that it remains within the allowable playback range overall, but also to watch the short term PSR to make sure it remains, on average, high enough. If PSR is very low, it could either mean that the music really does have gentle crest factors – like a sine wave with a crest factor of 2:1 (= 3dB) – or else that there is way too much compression and limiting happening, which will crush the sound on playback through the automated leveling. Actual loudness levels matter much less during recording, because they will automatically be brought into playback range by the leveling. For iTunes use, he recommends a PLR target of 15 dB, and an average PSR of greater than 10 dB. It is interesting to note that the way PSR and PLR are defined means that these are completely independent from the underlying track loudness level. 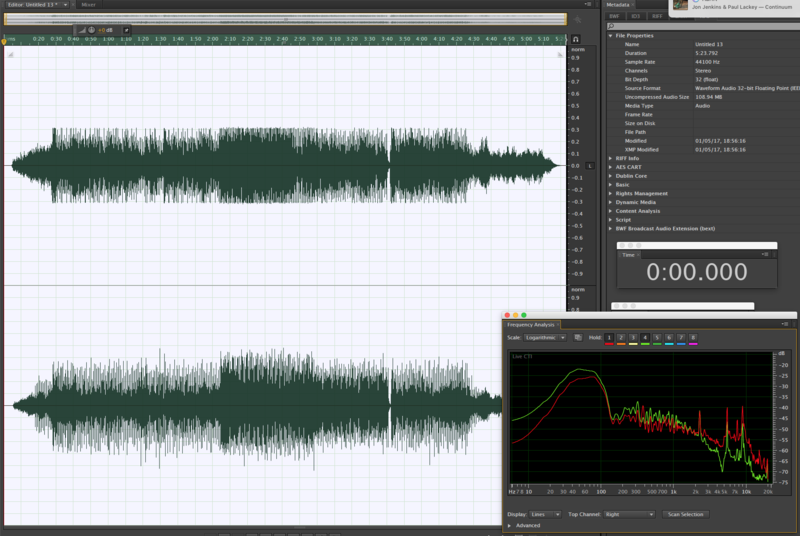 But these dynamic range measures are perceptually more important, regardless of playback level. The before is on top, and the after-DPS is on the bottom. It appears that the average is more controlled, and shows less variation in the bottom trace. That’s what Bongiovi states about his DPS process – his claim being that this is easier for speaker systems to accommodate and will sound better. The after-DPS track shows a 60% increase in the overall PLR for the entire track, and about a 12% increase in the average PSR, or short term crest factor. And you can see that the PSR also now shows greater local variation – an increase in the interesting short term dynamics of the music. What would be a better comparison here on the PSR would be a measure of their variability in the short term. The increase in the average PSR shows an expansion of the crest factors. But our hearing is relatively insensitive to crest factors on waveforms, and more sensitive to variations in loudness. We can also see that the DPS process levels out the music a bit, showing less fall-off in PSR toward the end of the track than before DPS. You can see that too, from the relatively tighter histogram shown on the left side of the graphs. So this looks like an improvement. And it sounds like an improvement too, when you listen to the two versions. [ I just noticed that the DPS process took that iMusic track from Apple, which fell short of the guidelines of PSR >10 / PLR = 15, and made it fit almost perfectly into that recommended range.